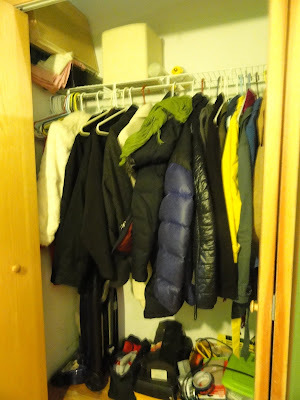 Since we moved in, I had visions of converting our hallway coat closet into something with a little more storage. We definitely had enough coats to fill the length, but with more than half those on display only being used a few months out of the year, we figured storing the out of season outerwear wouldn't bring any harm. After picking up a couple extra under-bed bins from The Container Store (surprisingly, best price found there, beating Target! ), I saw we could cut the "coat" part of the closet to half and install shelving up the other side. 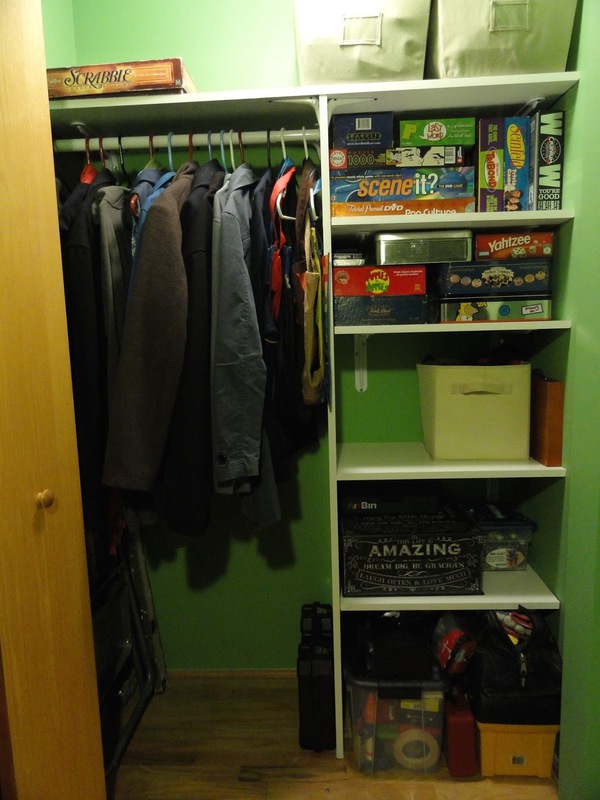 Options for shelving included hiring out a California Closets type company to come in and install or attempt to Do it Ourselves. Guess which option we chose? 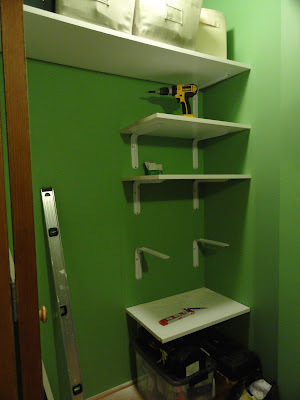 My challenge was how to find shelving in the exact right sizing, without power tools here at home. The standard white shelves at the local Ace didn't run exactly as we needed, with the longest shelf option being 48 inches. I found some on Amazon that were close, but no cigar. Then, after months of Lowes and Home Depot visits because of the bathroom model, we found ourselves in a Menards for the first time during all of these home projects (a tip from a fellow Home Depot customer on door options sent us the Menards way). 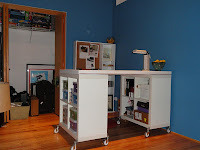 I found white slabs of shelving that they would cut to size, the longest option being 96 inches! Perfect! We went back home to do some measuring and determine how many shelves and how many cuts we'd need. A series of crude drawings determined we could comfortably fit in four 24" shelves with 10 - 15 inches of space between each and at least 20" up from the bottom to fit in our toolboxes. One long 55" shelf across the top at 72" up would hold the closet rod at the right height for coats. We also picked up the heaviest duty white brackets we could find and a couple boxes of anchors and screws. After clearing out the closet, removing the wire shelf ("No. Wire. Shelves. Ever!") and patching holes, Bob painted the inside of the closet with the same green as our hallway. 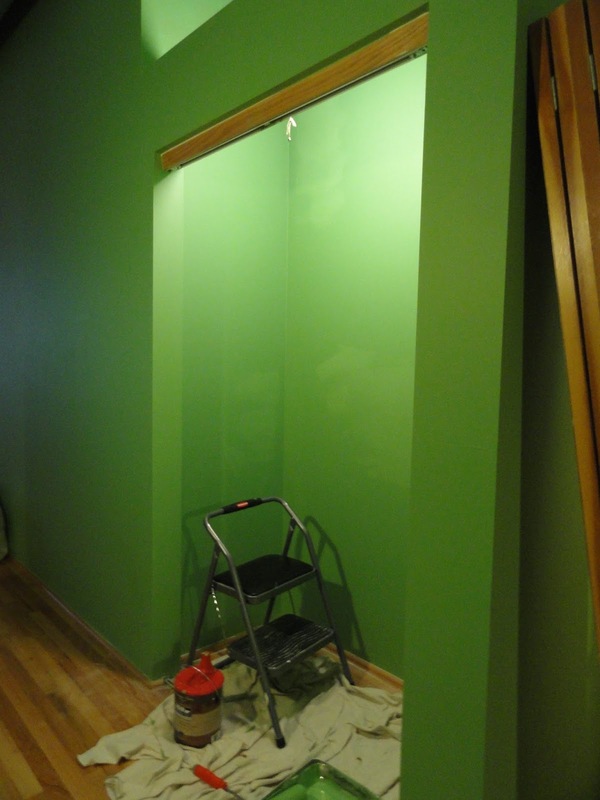 For a flashback, check out this post detailing our original paint choices upon move in! The measuring twice/drilling once process began and within no time we had the pieces in place. Since the Menards cuts were not super exact, there were a few instances of sanding needed, especially to get the vertical divider piece to stay level, but once everything was screwed together you couldn't really see any imperfections. 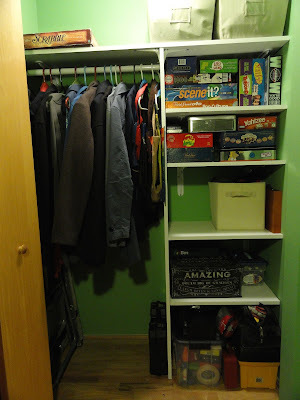 The shelves were quickly filled with games, art supplies and bins that were previously housed in the second bedroom closet, now displaced by baby sized hangers, a newborn tub and colorful storage containers. But that is another post altogether. . .Our vacuum cleaner (which had been out being serviced at the time of the rehaul) also fits snugly underneath the coats to fill up the left side. 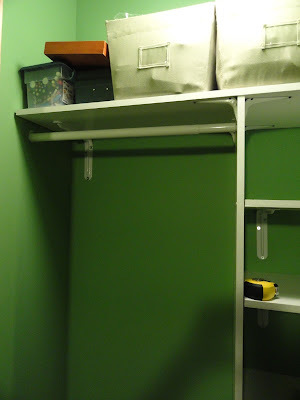 We are loving the organization and the crisp white against the green background. In retrospect, I wish I would have added a couple more inches of height to the bottom, and made the small shelves 25 or 26" wide instead of 24", as our toolboxes and bins are pretty well jammed in, but the sizes we went with definitely maximized the shelving we purchased, so it was probably the right move after all. It felt great to get this project started and finished across just 2 weekends - especially when the bathroom took us just about as long as as this baby is taking!